Original WWII Advertising poster (17″ x 22 1/2″) Rare Ronan art! Poster has fold lines with wear at the lower half above red area, some surface scuffs at bottom red area and some corner wear. This poster is overall in Very Good Condition. Please refer to the accompanying image for a detailed view of this original advertising poster. We are adding new WWI and WWII, advertising and travel posters daily so please check back for new items! 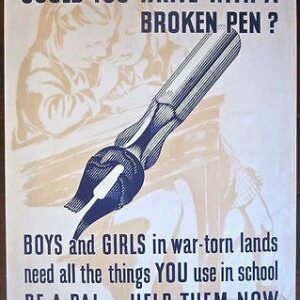 COULD YOU WRITE WITH A BROKEN PEN? - ORIGINAL 1944 WWII POSTER - CHILD STUDYING! 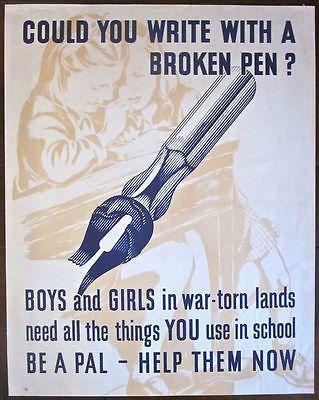 COULD YOU WRITE WITH A BROKEN PEN? – ORIGINAL 1944 WWII POSTER – CHILD STUDYING! cut 90 ON GUARD! IT'S A PRETTY BIG JOB FOR ONE BIRD WWI '17 LB POSTER- MATTHEWS! cut 90 ON GUARD! IT’S A PRETTY BIG JOB FOR ONE BIRD WWI ’17 LB POSTER- MATTHEWS!